We listed up our recommendations for you ! MonotaRO offers A4 paper and more. You can buy them anytime from our Malaysia online store. Type: Single-sided printing, Size: A4, Dimensions (Vetical x Horizontal) (mm): 297x210, Paper Thickness (g/m2): 86, Whiteness (%): 85 or so (ISO), Paper Thickness (mm): 0.1, Caution: Because it may cause paper curl and dirt, border less printing is not recommended. See more results of "A4 paper"
Want Photo Paper Crispia and Matte Clean Edge Business Cards ? Click Here. Paper for Colour And Black & White and N Colour 081 and other recommendations. Best Hit Inkjet Printer Paper Magnet Sheet and High Quality Graph Paper A4 ! Decal Sheet and Handmade Stickers Transparent Type are also chosen. Want Copy Paper and Color Copy Paper ? Click Here. Save File A4 and Color Copy Paper and other related products. Best Hit Clean Room Notebook and Perforated Paper ! 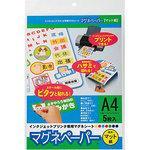 Inkjet Printer Paper Magnet Sheet and Multi Printer Document A4 White 3 Sided and other recommendations.